She famously puts lots of effort into her lush red locks for appearances at award shows – but when she’s offstage Adele doesn’t appear to be so well acquainted with a comb and brush. The scruffy-haired singer was pictured out in West London on Saturday looking as if she had just rolled out of bed. Perhaps she was making an emergency trip to the shops to collect some much needed products to tame her wild locks. Although the multi award-winning star had been spending most of her time in her Sussex mansion over the past year, she was spotted back in Notting Hill – where her mother Penny Adkins now lives in the singer’s former home – on Saturday. Dressed in a black poncho and leggings, the mother-of-one popped into a branch of Whistles clearly on a mercy dash to add to her wardrobe. Despite being free of make-up and without her trademark beehive, the Oscar-winnning singer failed blended into the homogenous mass of shoppers. 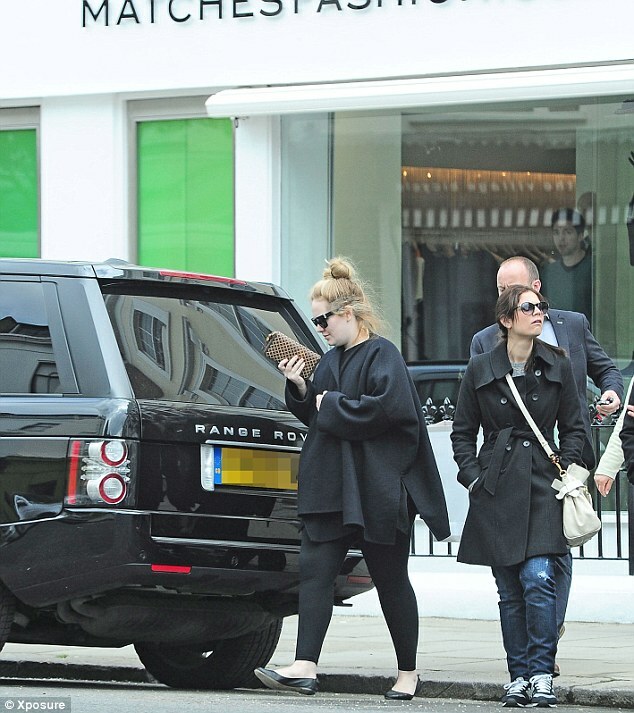 Her shopping excursion comes amidst reports Adele is back in the studio recording a follow-up to her 2011 album 21. With her first album being named 19 and her current age as 24, perhaps we can assume her third album will be named 24. Last week, the Mirror claimed Adele was on ‘lockdown’ in the studio and was also planning to record some of the album in Los Angeles. A source told the paper: ‘Adele is currently in a recording studio in London and it’s in lockdown mode for the next few weeks. Four tracks are finished in terms of writing and she’s now laying down preliminary vocals with backing music and singers. The rest of the record will be done in LA. ‘The feel is very much Adele going back to her roots, with some modern jazz and a couple of classic old songs.’ Adele’s last album 21 sold over 25million copies and won her a string of awards. However, over the past year she’s been taking a break to focus on her personal life, including meeting boyfriend Simon Konecki last year and the birth of their son Angelo last October. In an interview last year, she said she was in no rush: ‘They’ll come when they’re ready, and when I’ve got something to sing about. ”I’m just going to lay some concrete, set up home and just ‘be’ for a bit. There will be no new music until it’s good enough and until I’m ready.’ Of course, she was persuaded to come out of her break to record the theme song to the Bond movie Skyfall, which won her an Oscar, Grammy and Golden Globe. If Florence Welch could go back to any fashion decade, it seems pretty clear that the seventies would be her first port of call. The award-winning singer stepped out in yet another androgynous hippie look, wearing a tan fur coat on Friday. In a pair of brow-line, round patterned sunglasses, Florence, 26, nodded her fashionable head to the stylish rockers of 40 years ago. The singer’s combination of a cream shirt, high-waisted and patent black boots are reminiscent of the outfits worn by a young Patti Smith, known for her masculine take on style. Tweeting about the news, Florence said: ‘So honoured to be part of Gatsby. Cannot tell you what a dream come true this is for me. Nearly cried when I saw the trailer.’ ‘”Over The Love” was written specially for Baz Luhrmann’s film and features on the star-studded soundtrack released on May 6th.’ The official motion picture soundtrack has been produced by Jay-Z and will also feature tracks from Beyoncé, Andre 3000 and British three-piece Nero, who will bring a touch of EDM to the adaption of F. Scott Fitzgerald’s twenties novella. Florence can also feel happy by the fact that she has been placed as the fifth richest young musician in Britain, with an estimated £9 million fortune. She comes after former X Factor winner Leona Lewis and singer-songwriter Katie Melua, who are both worth £12 million, and Cheryl Cole, sitting on an estimated £14 million nest egg. 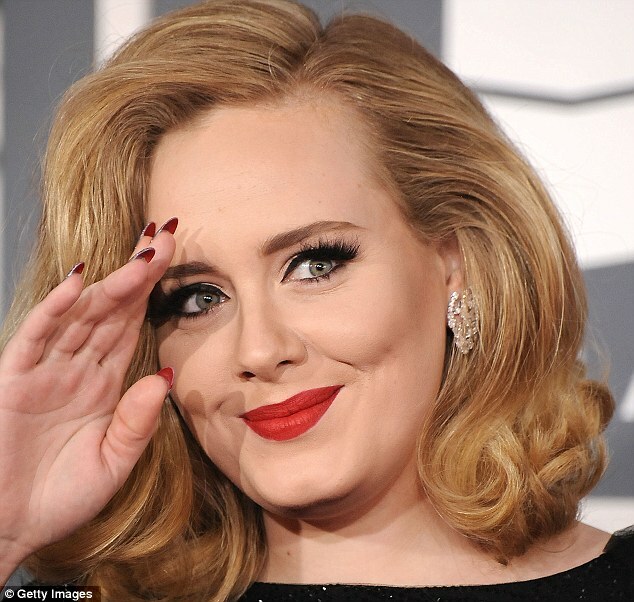 Adele’s £30 million fortune puts her at number one on the list according to The Sunday Times. 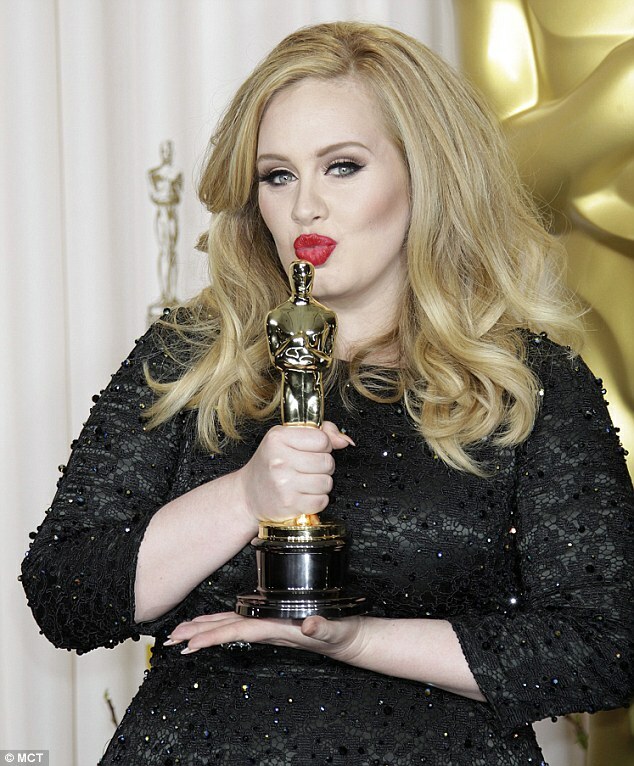 Adele tempted to sign $10 Million deal! British singer Adele is tempted to become the face of a cosmetic brand for $10 Million despite slating other stars for selling out with sponsorship deals. As rumour emerge the star could leave her native uk permanently to settle in LA fans of the star may start wondering how much the down to earth London girl has changed since hitting the big time. According to sources mother of one Adele 24 would not just take any sponsorship deal but is being tempted by the big money on the table. A friend told The Sun ‘ Adele is in big demand. ‘The last thing she wants is a cheesy ad with a naff catchphrase… It looks as if she’s close to signing a deal.’ In a 2011 interview, Adele, who is thought to have earnt $32 million last year, slammed stars who took money for any sort of ad campaign. She said: “It’s shameful when you sell out. It depends on what kind of artist you wanna be, but I don’t want my name anywhere near another brand. For the Grammy and Oscar winning actress her time in LA with her five-month-old son has been like a breath of fresh air. According to sources renting a house in LA was relaxing and after making friends with Robbie Williams’ wife, Ayda Field she is becoming more attune to shipping out of Britain for good.